The use and appearance of land in each green wedge area is unique. The landscape ranges from the Mornington Peninsula coastline, to the open basalt plains of the west, to the highly scenic countryside of the Yarra Valley. About one third of the total green wedge area is public land, including national parks, other parks, reserves, and closed protected water catchments. Where are Melbourne's 12 green wedges? 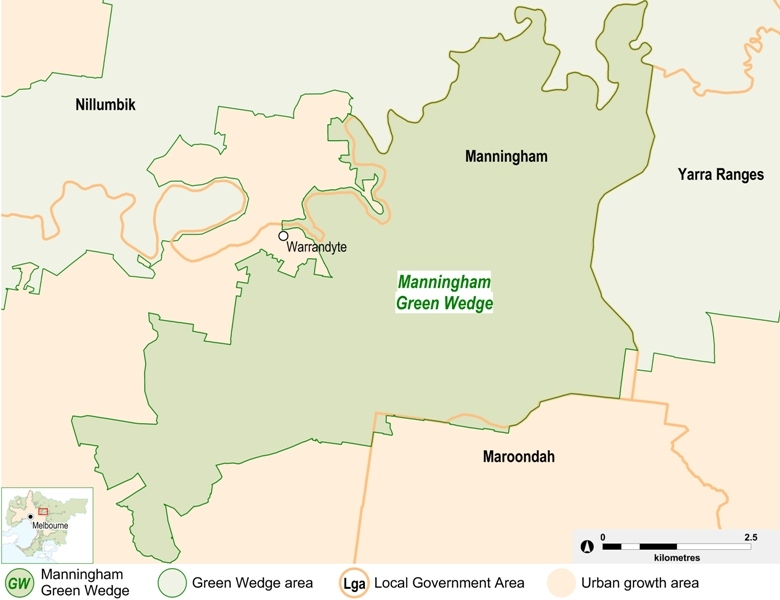 The Manningham Green Wedge is located within the City of Manningham with small portions extending into the Shire of Nillumbik and the City of Maroondah. lists priority actions for implementation from 2011 to 2020. 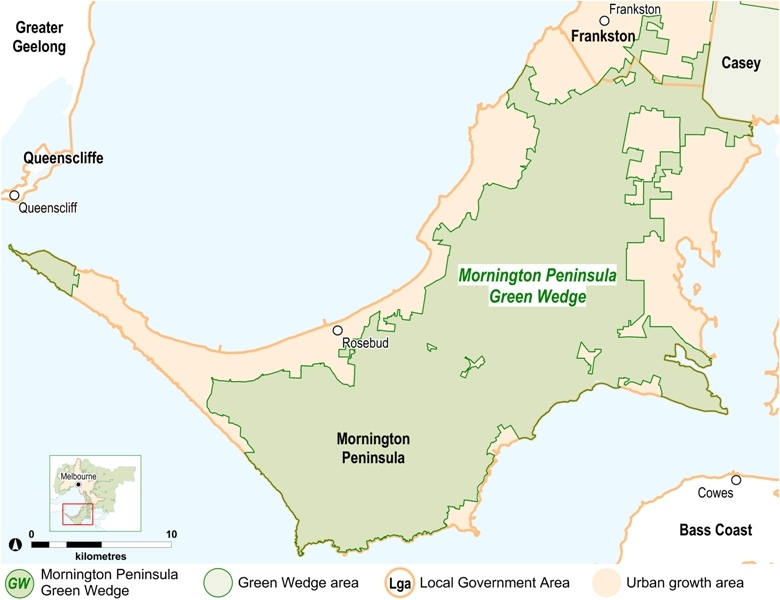 The Mornington Peninsula Green Wedge is located within the Shire of Mornington Peninsula with a small portion extending into the City of Frankston. Mornington Peninsula Shire Council is in the process of creating a Green Wedge Management Plan. Currently there is an interim Green Wedge Management Plan as a point of reference for other planning processes. 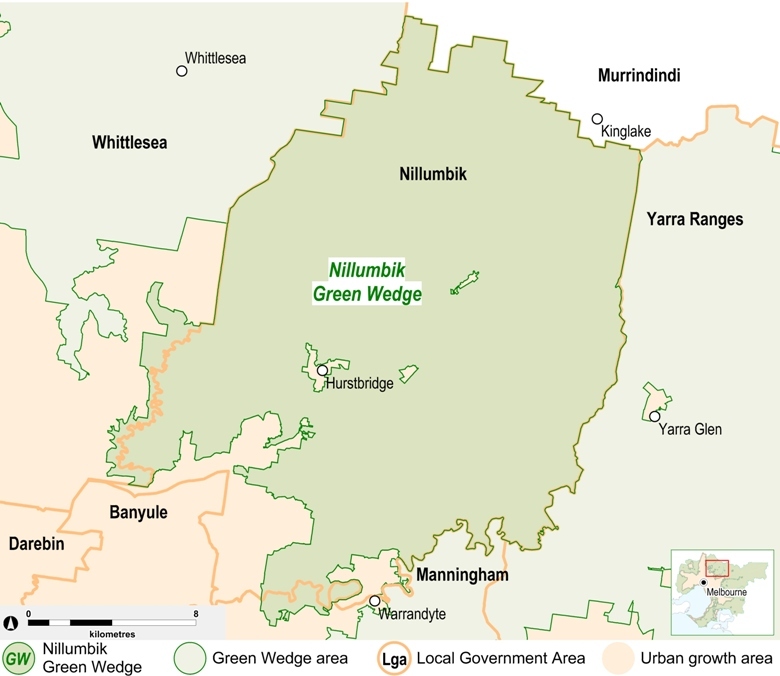 The Nillumbik Green Wedge is located within the Shire of Nillumbik with small portions extending into the City of Whittlesea and the City of Manningham. 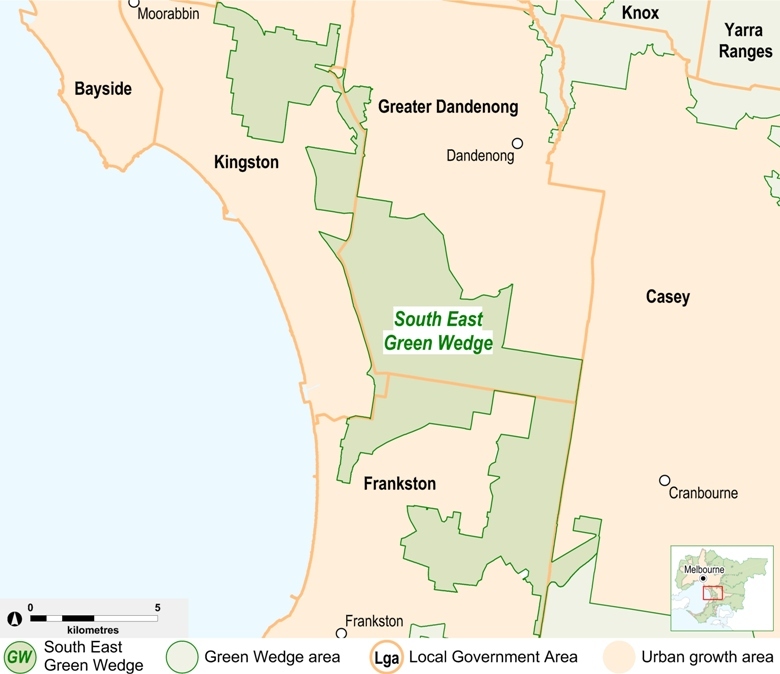 The South East Green Wedge includes land within Kingston, Greater Dandenong, Frankston and Casey. Kingston City Council has developed a Green Wedge Management Plan for the northern portion of the wedge and Greater Dandenong City Council is currently preparing a Green Wedge Management Plan for its portion. City of Kingston and City of Greater Dandenong websites. 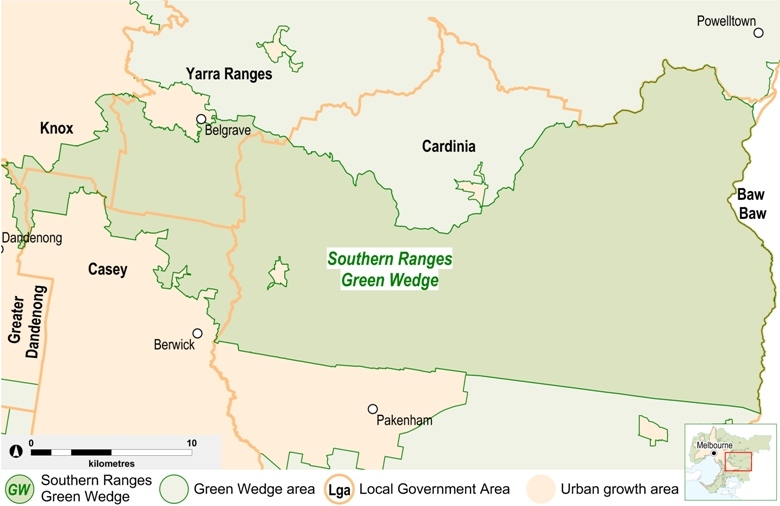 The Southern Ranges Green Wedge is primarily located within the Shire of Cardinia, with smaller areas extending into the Shire of Yarra Ranges, City of Casey, City of Knox, and City of Greater Dandenong. A Green Wedge Management Plan has not yet been created for this area, however the portion within the Shire of Yarra Ranges is covered by the Yarra Ranges Green Wedge Management Plan. 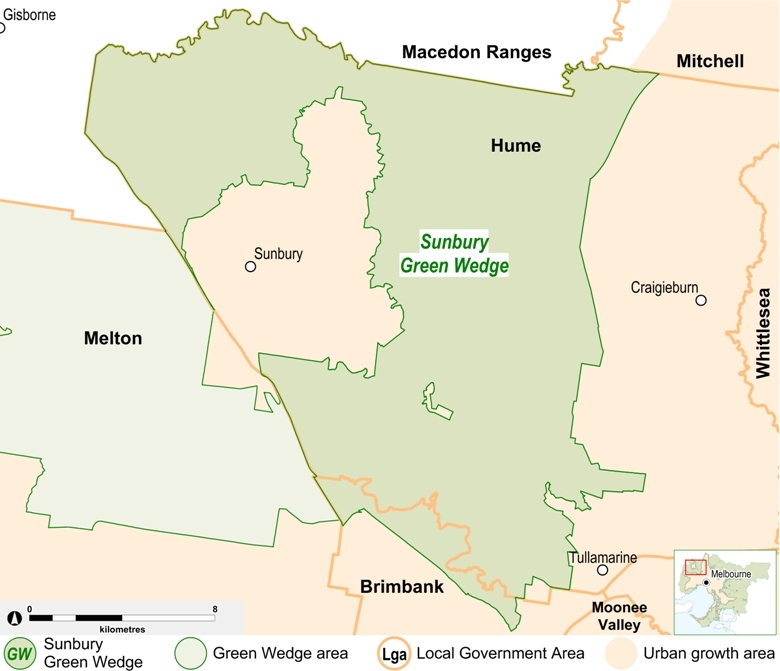 The Sunbury Green Wedge is located within the City of Hume, with a small portion extending into the City of Brimbank. Brimbank City Council has developed a Green Wedge Management Plan for the Brimbank portion of this green wedge, and Hume City Council has completed Phase 1 of development of the Hume portion of the green wedge area. The Werribee South Green Wedge is located within the City of Wyndham, with a small portion extending into the City of Hobsons Bay. Wyndham City Council has developed a Green Wedge Management Plan to plan, manage and protect this green wedge area. 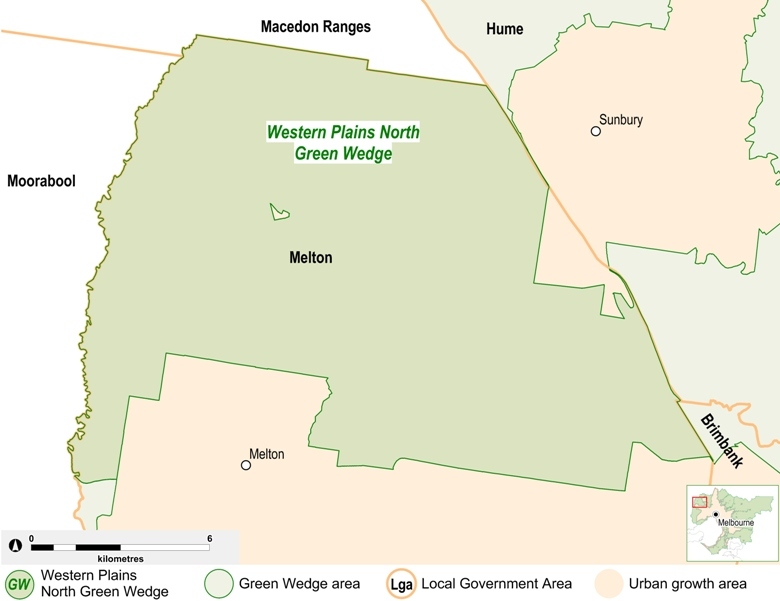 The Western Plains North Green Wedge is located within the City of Melton. Melton City Council is currently preparing a Green Wedge Management Plan for the Western Plains North Green Wedge. 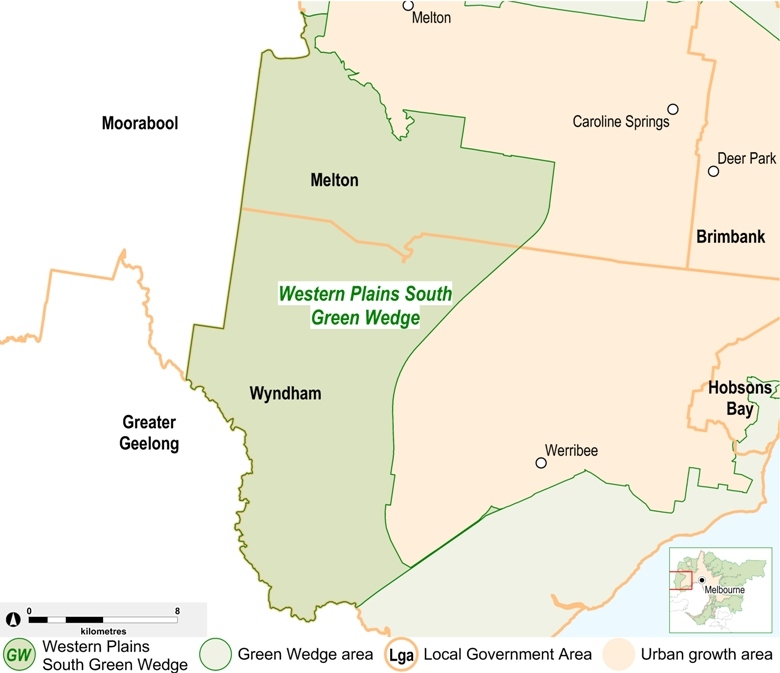 The Western Plains South Green Wedge spans across areas within the City of Wyndham and the City of Melton. There is currently no Green Wedge Management Plan for this area. 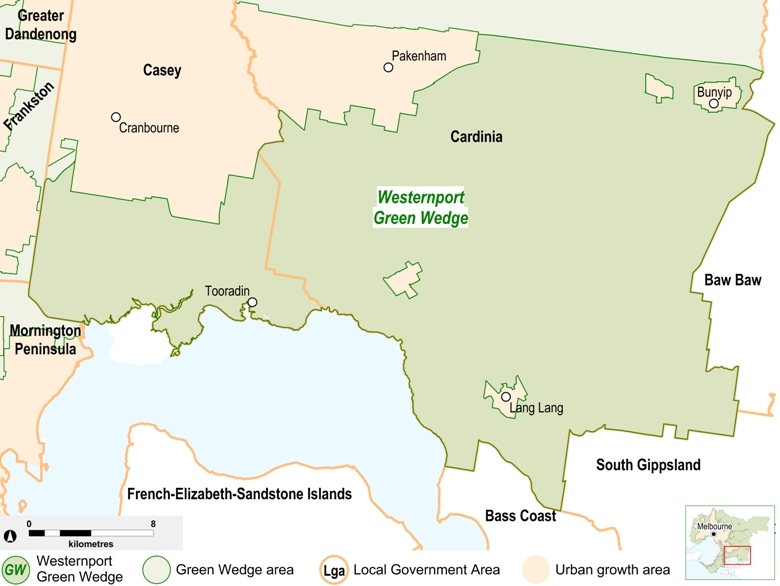 The Westernport Green Wedge lies largely within the Shire of Cardinia along with the southern coastal and rural parts of the City of Casey. The two councils are jointly developing a Green Wedge Management Plan. 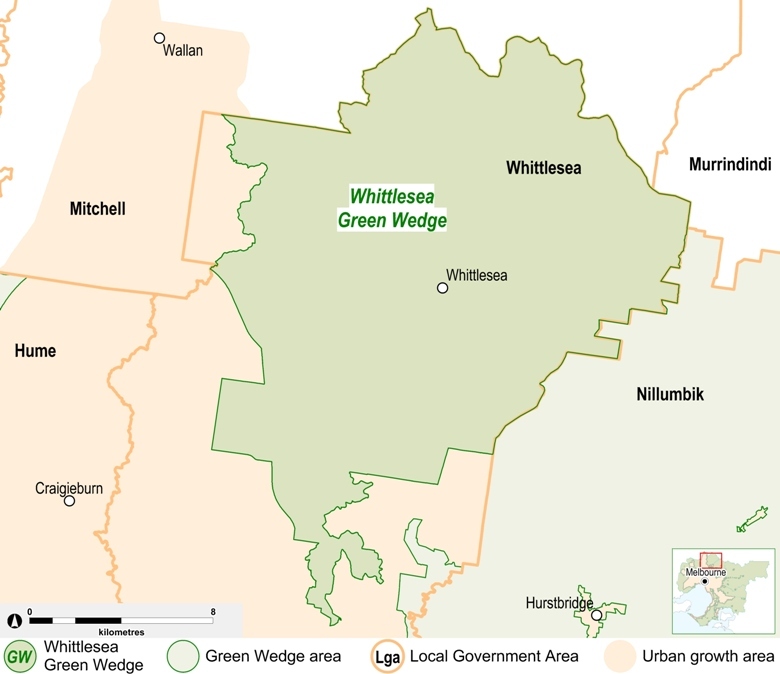 The Whittlesea Green Wedge is located within the City of Whittlesea. Whittlesea City Council has developed a Green Wedge Management Plan that provides a framework for sustaining this non-urban area into the future. 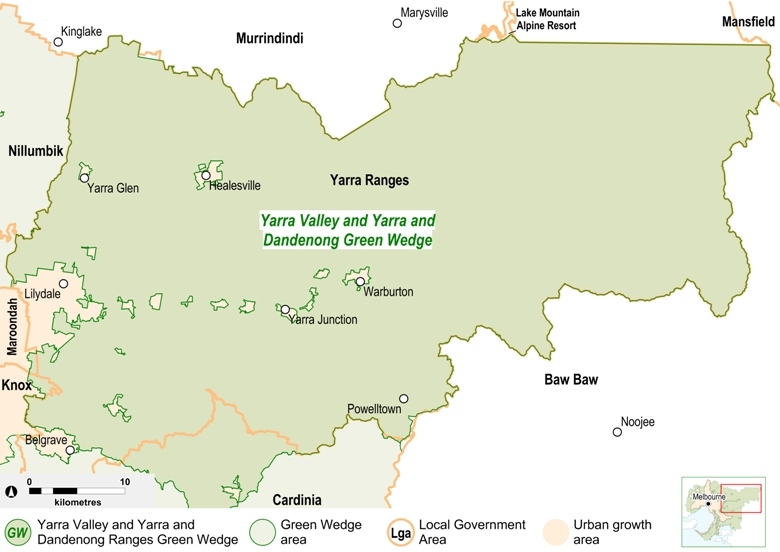 The Yarra Valley and Yarra and Dandenong Ranges Green Wedge includes non-urban land within the Shire of Yarra Ranges, the northern hills area of the Shire of Cardinia, and small portions within the City of Knox and the City of Maroondah. Yarra Ranges Shire Council has developed a Green Wedge Management Plan for Green Wedge land within its municipality, which covers most of the wedge. The southern portion is known as the Northern Ranges Green Wedge and is within the Shire of Cardinia. The council has started creation of a Green Wedge Management Plan for the Northern Ranges. Councils must prepare Green Wedge Management Plans because the land and conditions in each green wedge vary. how those changes will be managed and facilitated. The Victorian Government helps councils prepare Green Wedge Management Plans by providing targeted funding, technical advice and guidance. PPN31 - Preparing a Green Wedge Management Plan (DOC, 188.5 KB). Melbourne's planning policies have tried to protect non-urban areas for over 40 years. Policies such as Shaping Melbourne's Future (1987) reinforced protection for non-urban areas. the regional component of all metropolitan planning schemes was amended to incorporate a policy statement for non-urban areas. Living Suburbs (1995) didn't focus on green wedges, but it included objectives to protect the non-urban values of these areas. 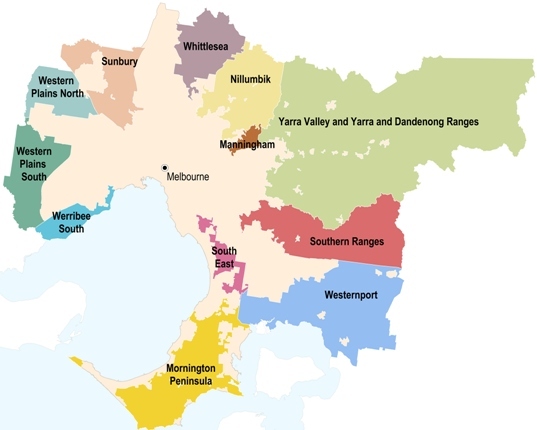 A standardised framework based on the Victoria Planning Provisions (VPP) was introduceed as part of reforms to the Victorian planning system in the mid 1990s. The term green wedges was formally recognised in the Melbourne 2030: Planning for Sustainable Growth metropolitan strategy. An urban growth boundary was introduced to manage outward expansion. Green wedges were enshrined in legislation and the Victoria Planning Provisions. The government established new localised statements of planning policy for four key special areas within Victoria. Two are located in green wedge areas: Mornington Peninsula and Yarra Valley.